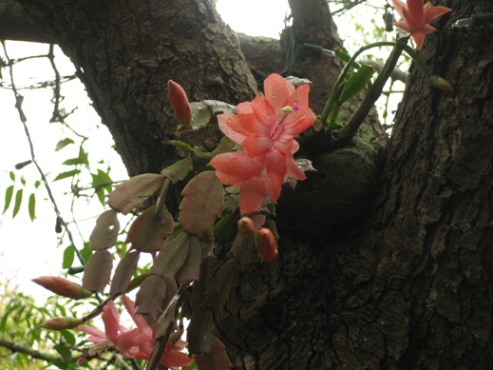 Yes Maurice - I also grow epiphytes in some of my trees - including zygocactus, epiphyllums, dendrobiums and bromeliads. I have plans to add a lot more now I have seen your photos on your website! 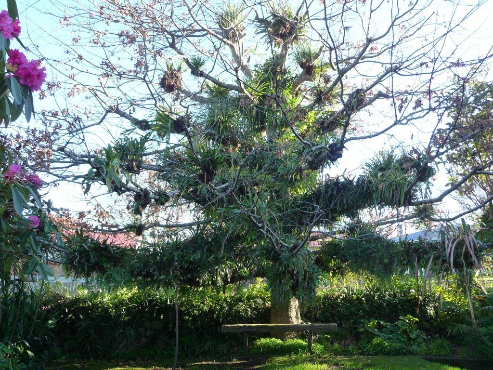 Hi Deirdre it is amazing the number of epiphytic plants that can be grown in a garden situation. Apart from frost in winter my biggest problem is dryness (Easily fixed with the garden hose)Nothing says subtropical more than trees dripping with epiphytes.Beautiful cactus photo BTW. Maurice. Wonderful pics Maurice and Deidre. I am waiting impatiently for a suitable tree. What I currently have are either too big, not big enough r in the wrong position. Question: do possums or cockatoos bother the epiphytic plants ? I have loads of both, in fact I have cockies who like pruning my pot plants or digging plants out of hanging pots. Carole - I haven"t yet had a problem with the cockatoos or possums attacking the epiphytes, and they are in a tree the leaves of which are attacked by both! wow! your tree is amazing , i found it to dry out here in inland nsw to grow epiphytes. Im very jealous! I"m keen to get started on my epiphyte tree. Successful growers tell me that all I have to do is grab a handful of Tillandsia seeds ( or any other brom seeds) and wipe them down the trunk of a rough- barked tree eg. Callitstemon, pine, silky oak. Sounds easy but should be exciting to wait and watch!